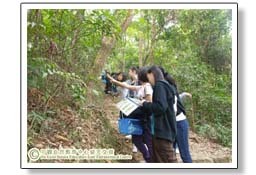 To facilitate the implementation of NSS curriculum, HKNEAC offered residential field studies for senior secondary Biology students. It is expected that through field studies, students can further develop skills in planning and conducting investigations, communicating information and understanding, scientific thinking and problem-solving as well as working individually and in teams. Scientific investigations involve observing phenomena, defining problems, formulating hypotheses, designing and conducting investigations, and interpreting results. These kinds of activity are not only for verification purposes, but also allow students to understand the process of science, including how to clarify questions, how to design an experiment, how to record and interpret data, and how to communicate the knowledge generated. It should be noted that developing science process skills is as important as finding correct answers. Students are expected to master much more than facts and manipulative skills through field studies. They must learn to be critical thinkers. In the field survey, students have to differentiate and characterize the different habitats such as secondary forest, plantation, shrubland and stream etc. They shall also learn simple classification of common local plants and animals, and their relationship with the abiotic factors. 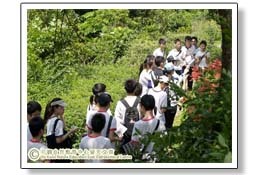 The course also helps students to develop appreciation of the biodiversity and respectfulness towards all living things. 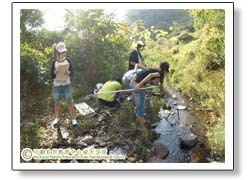 Students go to the typical upper stream for observing and recording animal and plant species and measuring the abiotic factors. Water samples are taken for chemical analysis. 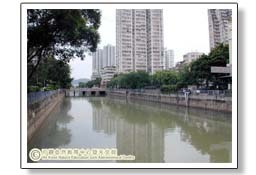 In the course, students should able to understand the functioning of an ecosystem. 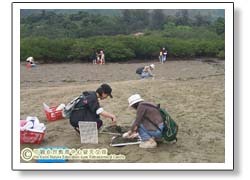 Mangrove stands is one of the most well known coastal habitats. 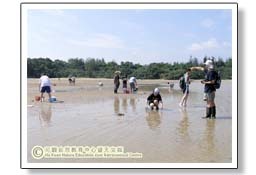 Students can learn how to identify different mangrove plant species as well as diversified animals living in the inter-tidal zone, and at the same time to measure various abiotic factors of the habitat. By observing the distribution and adaptive features of the animals and plants, students could better understand the relationships between the physical environment and living organisms. 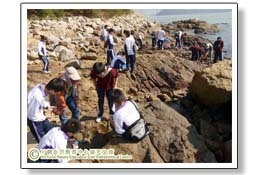 Students observe and record animals and plants of a rocky shore and also measure the abiotic factors. Water samples are taken for chemical analysis. In the course, students should learn the concept of zonation and know more about the functioning of an ecosystem. Students observe and record animals and plants of a Sand Flat and also measure the abiotic factors. Water samples are taken for chemical analysis. In the course, students should learn the concept of zonation and know more about the functioning of an ecosystem. Students can visit the internationally important wetland Ramsar Site, to learn about the wetland habitats and the birds inhabiting in. 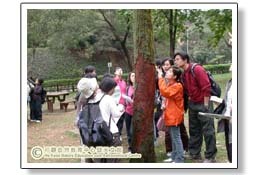 They can learn basic technique of birdwatching and identification and use the spotting scope and binoculars to conduct simple count on the birds. 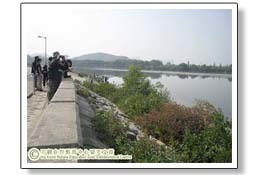 Students can enjoy the birdwatching activity and hence appreciating the nature. 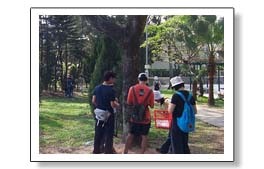 Investigation is conducted in the two Butterfly Gardens in Shing Mun Country Park. Students shall learn the basic skills in butterfly watching and identification and try to conduct the butterfly and to measure abiotic factors. Finally, stuents try to find out the relation between the environment and butterfly distribution. In the city grdens, through systematically observing and recording living organisms, students are able to apply and consolidate their knowledge on classification and ecosystem. 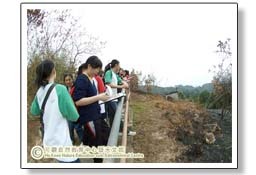 Students go to sites with different air pollution level, measure the amount of various pollutants, and at the same time, observe distribution of biological indicators, so as to study the issue of air pollution in deep. This course combines field study and issue-based discussion. Students shall visit a place with controversial development proposal. Students can learn about the species and habitat with conservation value and know about the developmental needs. Through discussion, students are encouraged to reconsider the concept of Sustainable Development and its applications.